Unusually, instead of making a single horse portrait, John Frederick Herring shows the whole field of twenty-two runners for the 1834 Derby. A subsequent owner provided a key to all the horses, which has remained with the painting. 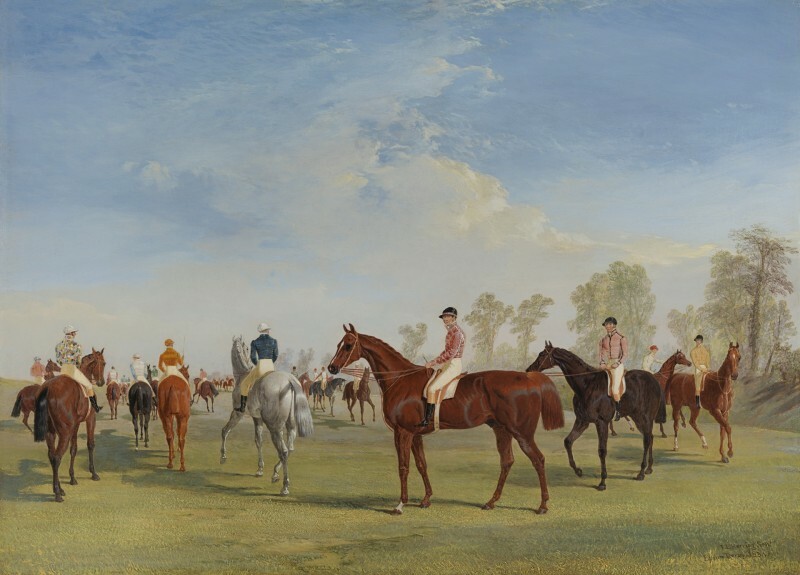 The Derby of 1834 was won by the chestnut colt Plenipotentiary, ridden by Patrick Conolly, which stands proudly at the centre of the painting. By Emilius out of Harriet, he was bred and owned by Mr Stanlake Ricketts Batson of Horseheath Lodge near Cambridge, who lived a few miles from Six Mile Bottom, where Herring was domiciled in the early 1830s. Plenipotentiary won two races over the Rowley Mile at the Craven Meeting of 1834. Plenipo’s (as he was popularly known) career was not untouched by the rollicking skullduggery of the Georgian horseracing world. His pre-race price for the Derby was steady at 9-4. His main opposition was thought to be the Duke of Cleveland’s Shilelagh, an unraced bay colt, sired by St Patrick, purchased from the Chifneys and ridden by Sam Chifney Junior. The Chifneys and the Duke had been steadily backing Shilelagh for the Derby, but wishing to advance the odds in their favour, sent a ‘ringer’ (a similar-looking horse) out onto the gallops with blistered legs and bandages. Shilelagh’s price drifted to 11-4. Thursday 29th May 1834 dawned flawlessly bright. Before the huge Derby crowd, Plenipo and the Earl of Jersey’s Glencoe were away very fast. Conolly eased Plenipo back after two furlongs and he was in sixth place at Tattenham Corner. Into the straight, Conolly pushed Plenipo through a gap to join the leaders; he romped home by two lengths, with Shilelagh in second place and Glencoe third. In Herring’s painting, Shilelagh is to the right of Plenipo and the chestnut Glencoe, with Jem Robinson up, to the right of Shilelagh. The prize money was £3,375 and Mr Batson celebrated by adding a new wing to Horseheath Lodge and allowing his tenants free rent for a year. Plenipo was favourite at 10-11 for the St Leger, but was unplaced behind the Marquess of Westminster’s Touchstone at 40-1. It later transpired that Plenipo had been doped: the head lad, who died unexpectedly, confessed as much on his death-bed. In 1835 Plenipo won three races in five days at the Craven Meeting. The following year he retired to Mr Batson’s Horseheath Stud and died in 1854. He sired the Two Thousand Guineas Stakes winner Montrosity and the Oaks winner Poison. John Frederick Herring was the son of a London merchant of Dutch parentage, who had been born in America. The first eighteen years of his life were spent in London, where his greatest interests were drawing and horses. In 1814 he moved to Doncaster, arriving just in time to see the Duke of Hamilton’s William win the St. Leger. By 1815 he had married Ann Harris; his sons John Frederick Herring Junior, Charles and Benjamin were all to become artists, while his daughters Ann and Emma both married painters. In Doncaster, Herring earned his living as a painter of coach insignia and inn signs and his contact with a firm owned by a Mr Wood led to his subsequent employment as a night coach driver. His spare time was spent painting portraits of horses for inn parlours and he became known as the ‘artist coachman’. Herring’s talent was quickly recognised and he soon found himself painting hunters and racehorses for the gentry. In 1830, Herring left Doncaster for Newmarket, where he spent three years before moving to London. During this time, he may have received tuition from Abraham Cooper. In London, Herring got into financial difficulties and was rescued by W T Copeland, who commissioned many paintings including designs used for Copeland Spode bone china. In 1840-41, Herring visited Paris by invitation of the Duc d’Orleans, for whom he painted several pictures. In 1845, Herring was appointed Animal Painter to HRH the Duchess of Kent, followed by a commission from Queen Victoria, who was to remain a patron for the rest of his life. Herring spent the last twelve years of his life at Meopham Park near Tonbridge, where he lived as a country squire. He now broadened his subject matter and painted agricultural scenes and narrative pictures, as well as his better known works of hunting, racing and shooting. A highly successful and prolific artist, Herring ranks with Sir Edwin Landseer as one of the most eminent animal painters of the mid nineteenth century. His paintings were very popular and many were engraved, including his thirty-three winners of the St Leger and his twenty-one winners of the Derby. Herring exhibited at the Royal Academy 1818-65, the British Institution 1830-65 and the Society of British Artists (whose Vice-President he became in 1842), 1836-52. See Michael Church, The Derby Stakes: The Complete History 1780-2006, Compton 2006, pp.172-3. Painting signed and dated 1834, with Richard Green in 1975. See Oliver Beckett, London 1981, pp.105, 146.